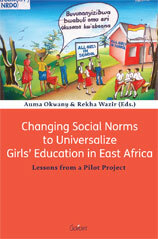 :: www.maklu.be :: Boekdetails :: Changing Social Norms to Universalize Girls' Education in East Africa. Lessons from a Pilot Project. Changing Social Norms to Universalize Girls' Education in East Africa. Lessons from a Pilot Project. The educational experience reproduces gender ideologies and social norms, which interact with schooling for girls in very particular ways and are implicated in their persistent gendered exclusion and marginalization. The authors in this volume focus on this link by taking a social norms approach to profile the processes, strategies of and research on community-led interventions. The chapters are paced around a pilot project that critically adapted a successful model in India to develop context-appropriate integrated approaches to universalizing secondary education for girls in purposively selected rural and urban poor contexts in Kenya and Uganda. The analyses provide reflexive documentation of the successes and challenges of project implementation activities that have successfully contested girls’ exclusion and marginalization in education. This requires a sustained focus on the link between social and educational institutions and policies and working in an integrated manner with a range of policy actors including young people and targeted communities to bring about significant and sustainable change.